Mental Health. A subject that for many is difficult to talk about, understand or even relate to. For years, mental health conditions have been seen as taboo, but luckily this is slowly becoming a thing of the past. This is thanks to initiatives such as Heads Together, a campaign backed by the Duke and Duchess of Cambridge, alongside Prince Harry, to end the stigma around discussing mental health and illness. 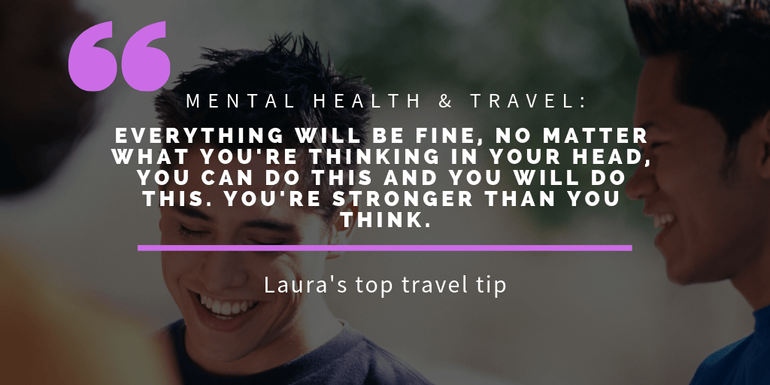 You’ll know from our past blogs that we have covered topics on travelling with a hidden disability, so we thought it was about time we looked into travelling with mental health issues too, because let’s face it, it’s got to be just as challenging, right? Back in January 2017, we sent a survey out across social media with a range of questions designed to give us an idea of what travelling was like and what issues may be faced by those battling with their mental health, their family members or carers alike. The answers sometimes shocked us and broke our hearts, but we were equally warmed by the sense of community and the openness and honesty of everyone that took part. Who took our Mental Health and Travel survey? It was interesting to see how many identified with being affected by more than one illness, too. Something that maybe isn’t always taken into consideration by those who don’t have an illness. For instance, an eating disorder may also trigger anxiety and OCD. So what did we ask and find out? Below we have summarised each of the questions we put to our respondents; how much of this can you relate to? Or have you ever considered that a fellow passenger could be facing these situations? Hover over the slides if you need more time to read! A huge 76% responded Yes to the above question, with plenty of explanations as to why. 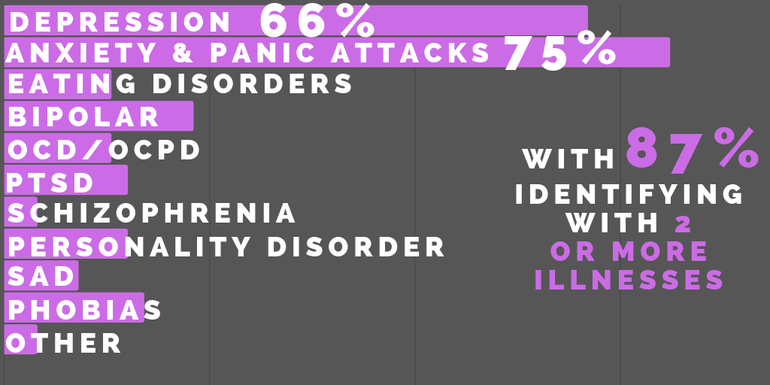 Alongside those mentioned in our graphic below, reasons included feeling too overwhelmed, it causes too much stress, public places are too dirty and people don’t care about those who don’t outwardly look like they “have something wrong with them”. We then asked, “Do you think there is enough support in the tourism industry for those travelling with a mental illness?” to which the answer was a resounding No. Many stated that they felt mental health issues or illnesses weren’t seen as a ‘problem’ and therefore assistance isn’t offered in the same way it would for a person with an obvious, physical disability. Several respondents picked up on just how stressful travelling can be, and many felt that this isn’t taken into consideration at security checks for example. Those with anxiety or bipolar for instance stated they may be perceived as acting “strangely”, leading to questioning by security staff, thus unfairly worsening their mental state. Throughout this project, we have been lucky to work with representatives from several leading charities and organisations, who were more than happy to share their experiences of travelling with a mental health condition. First up, we spoke to Jayne Hardy, Founder and CEO of the Blurt Foundation, a support organisation she set up after she lost the majority of her twenties to depression. Here she speaks about how her anxiety can hinder her travels. Just click the arrow to the right of the image below to read her story. Direction signs that merge into a yellow blur, arrival and departure boards clicking away, all this is a sensory nightmare and my brain is in overload, panic is now starting to set in, and still, there is no one I can see who could help me. If I tell them I am suffering from acute anxiety would they even understand? Worrying about travel is normal. I know I certainly did. Sitting in the back of a car on the way to Heathrow Airport with a one-way ticket to Thailand, with no real plan, terrified me. This was the most spontaneous thing I had ever done, but when my boyfriend Will got a job teaching English in a village in Northern Thailand, I knew I had to risk it and go. Arriving in Long with no hot water, geckos on the walls and a toilet that only flushed manually, I was already out of my comfort zone. What was I going to do about food? Calorie counting? Exercise? I was terrified. I was going to come back huge! But the reality was that actually there was something quite refreshing not having to think about food whilst I was away. Calorie counting was impossible. No matter the situation or what condition the traveller is affected by, it’s clear that there are plenty of shared experiences. Here’s how several of our respondents described their experiences of travelling, in particular the airport journey itself. Does your mental health affect your travel insurance? 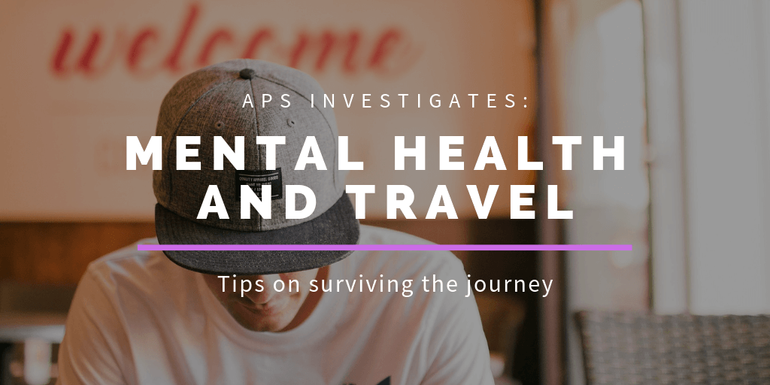 Along with everything you might need to consider when you are travelling with a mental illness, there are other factors that were brought to our attention during this survey, and one of those was that of travel insurance. Insurance is something that everyone should have when they travel overseas, but as with having other pre-existing conditions, getting cover can come at a price. You’ll usually be seen as “high risk” and so therefore companies are reluctant to cover you, or if they do, you have to foot a hefty premium. As you’ll see in the graphic above, one of our respondents stated that their original flight home was not covered by insurance when they needed to fly home sooner because mental health reasons aren’t considered an emergency. Hardly seems fair, does it? “Having a mental health problem can make travelling challenging, especially abroad, but it shouldn’t stop somebody seeing the world. We hear from people who have found it difficult to arrange insurance because of a pre-existing diagnosis for example, or from people who are unsure what kinds of medication they can take overseas with them. There’s still a way to go to overcome this issue in the travel insurance industry, but it’s definitely something that travellers should be aware of when looking to go away. What more can be done to help people travelling with a mental health condition? Many of the respondents said that training for transportation staff in general needed to be rolled out, and any available assistance should be made clearer to those who may require it. Other suggestions included separate seating areas for those with anxiety disorders to keep them away from too much crowding, priority queues for security and boarding the plane, and making it easier to access help. 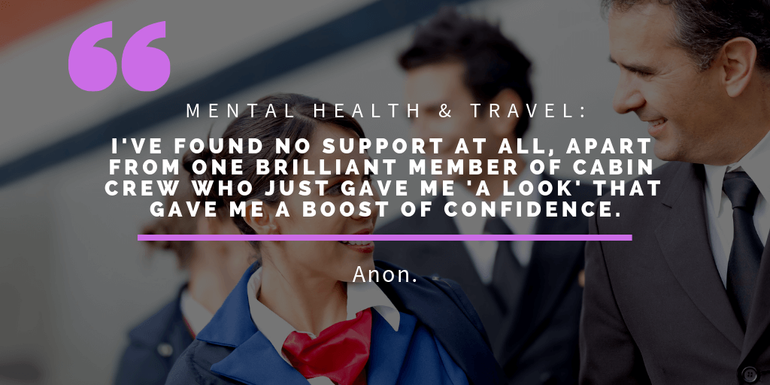 As one respondent, Mary, pointed out, “There seems to be very little way of 1) making travel companies aware of a mental health problem 2) getting across the difficulties it can cause even if on the surface the customer ‘looks OK’“. Travelling abroad? There are plenty of websites with information on the things you should consider before travelling, should you decide to do so. Most notably, you should research your destination; what mental health support facilities and organisations are in the area? Could you contact them prior to arrival to book in to any sessions at all? Are you comfortable in a foreign country? If you’ll be travelling with a companion, perhaps ask them to help you with the planning should you find it daunting. On the flip side, if planning activities in advance makes you anxious, perhaps just a collection of information that’s ready to hand would be useful. It may also act as a nice distraction from any worries you may have. Here, Polly from Bridge Mental Health explains how you can prepare for a trip if you’re feeling nervous. Just click on the arrows to read more! “Mental health problems are regarded as one of the most common forms of illness and disability. We know that one in five people in Northern Ireland reported having mental health problems costing the local economy well over £3.5 billion per year. As part of the partnership with Belfast City Airport, we are trying to find bright innovative ways to make people more aware of their mental health, and believe the mindfulness classes at the airport will do just that. People travel for a number of reasons and some find the journey itself stressful. If staying in the UK, there are plenty of charities offering respite care, short trips and weeks away for those with mental health conditions, the cost of which can usually be subsidised by the charity. Each charity will offer something different, so keep that in mind. For instance, Making Space offer breaks for those with schizophrenia, Diana’s Supported Holidays offer supported trips around the UK and abroad, The Kiloran Trust offer respite breaks in London for carers and Revitalise offer breaks for adults with learning difficulties with 24 hour subsidised care. Mental Health charity Mind has a network of 140 local Minds across England and Wales, some of which offer group trips. Look up your nearest local Mind to find out more. 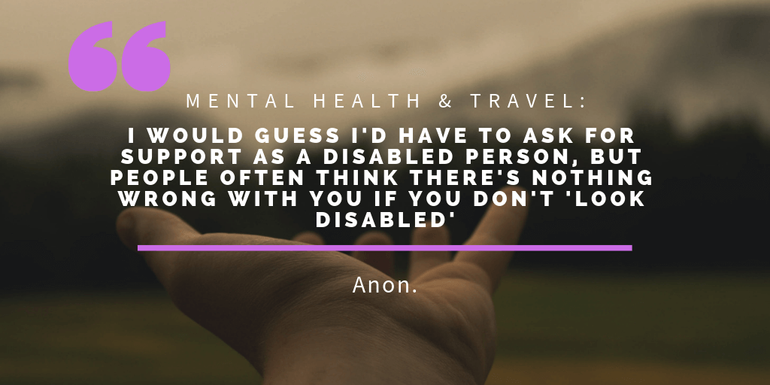 Finally, we asked our respondents what piece of advice they would give someone else travelling with a mental illness to which we received an overwhelming response! A lot gave the same advice on planning and travelling with a companion, and also to have back up plans should things not quite pan out as you’d expected them to. Although there was a resounding message of taking a travel partner to make things easier, a few advised travelling alone to help you combat your own fears and make you stronger. Which do you agree with? Each of these tips are direct responses to our question; click right to read them and hover on the slide if you need more time to read! Why is Mental Health so important today? 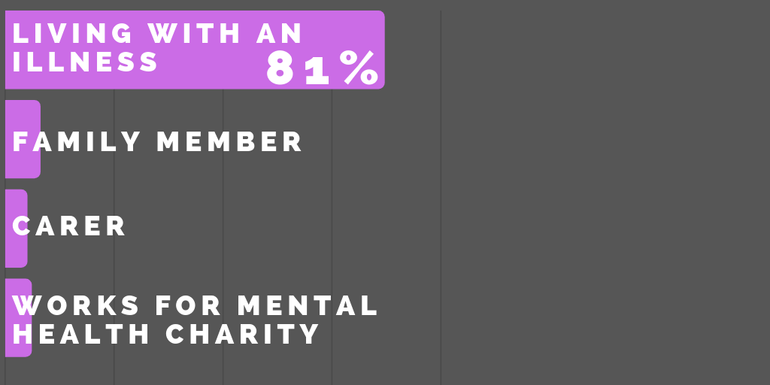 Mental Health awareness has been gradually increasing over the last couple of years, thanks to various initiatives throughout the UK. The Heads Together campaign caught our eye in particular when we saw that it is heavily supported by Neil Laybourn and Jonny Benjamin, two of the UK’s biggest mental health campaigners following on from their Stranger on the Bridge story. 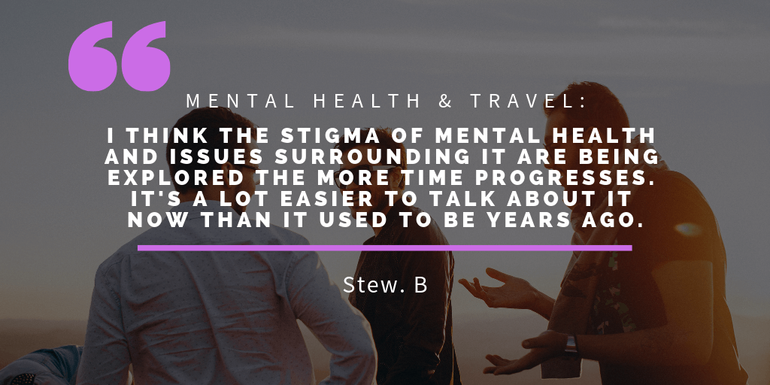 They both tour the UK to run various workshops and talks about all things mental health, so it’s safe to say they know a little about the impact travel can have on their mental health! Mental health forms part of everything we do. If conditions get so bad it means people don’t feel they can travel, what kind of life is that? We don’t just mean not being able to jet off to a tropical climate, but seemingly simple journies like getting on the train or bus; if we don’t have an understanding of why this may be difficult or upsetting for some, how can we support them? 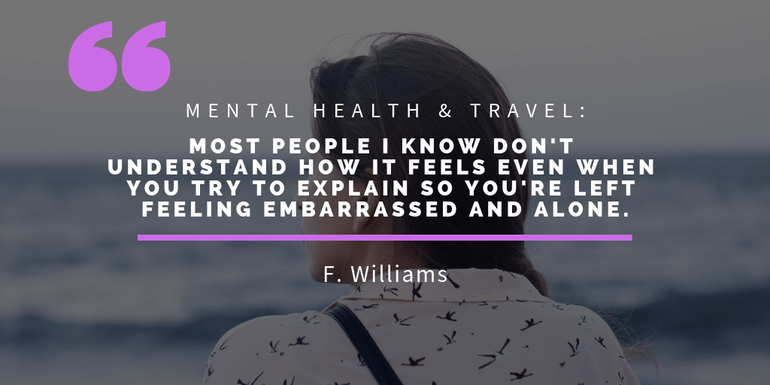 This article is amazing, full of loads of experiences, advice and ideas from different people with lived experience of mental ill health and how this can impact on travelling. Everyone in the tourism and travel industries should sit down and read it. They would then understand that ill health does not make people difficult or dangerous would see that all that is needed is some good old fashioned kindness, support, patience, a few adaptations and hey presto, the service provided can be improved a hundred fold. I think this is a brilliant article. 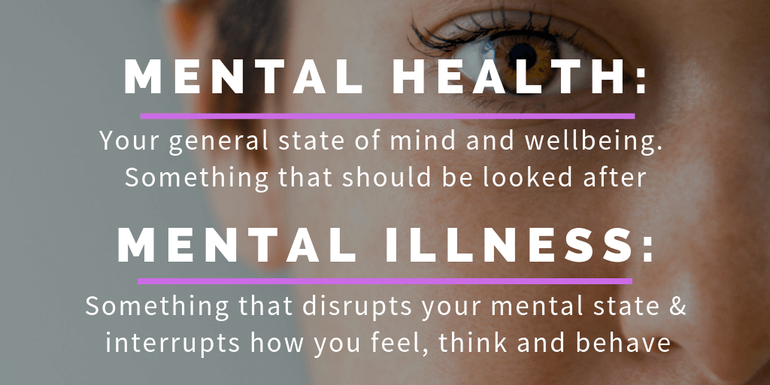 Mental illness needs to be more spoken about and how it affects people’s life. Travelling in this day and age most of us take for granted. I am on The Autistic spectrum and have had crippling depression for years. I’ve found that one of the few things that keeps me going is the prospect of travelling, from escaping from the reality that drags me down. I would urge anyone to not be put off by the barriers that present themselves but, if you want to travel, to get out there and do it. Don’t let over fussy companies and insurers put you off. The stigma attached to mental health is terrible and travel companies and insurers often can’t see the benefits we derive from travel. We are viewed as an inconvenience or a potential claim rather than just another client who wants to have a great trip. That discrimination has to stop. Travel can provide the opportunity to meet new people and experience new cultures. It broadens our horizons and, in my case, engenders positive mental health. Great article, thought provoking and something that should be read by everyone in the industry!. Ps. Open to job offers lol. Gosh, I’m literally in tears reading this. I really, really thought I was the only person in the world who struggles massively with mental health problems & travelling. I have anxiety disorder & OCD & whenever I fly, I have to take a large dose of diazepam otherwise I can barely make it through passport control without completely breaking down. That’s a long time before I’ve even stepped foot on the plane which is my MAJOR hurdle… I’ve cancelled flights before, refused to board an aircraft causing delays for everyone which made me feel about 100 times more anxious & depressed!! I’m travelling to Spain with my family in June & it takes a massive amount of “self counselling” to enable me to do it. Once i get to my destination, the first day of my holiday is wasted as all I do is sleep because the build up of the journey & journey itself has exhausted me. What an absolutely brilliant article!!! This is all fantastic stuff. But there is another condition that makes travelling a nightmare? That is Dyslexia. Airports are starting not to announce flights, but telling travellers to keep an eye on the written boards? If reading is a problem. and when stressed that reading becomes unreliable, how can Dyslexics hope to travel at all? Excellent point Cathleen, and fuel for another spotlight blog..! I find it refreshing that mental health is coming to the fore of society’s understanding of being disabled. Being a physically disabled person for many years I did need help in travelling for work around Europe. I use a walking stick so it is fairly easy to see I have some sort of impairment and was offered assistance even on occasions when I had not requested it. For staff to identify people mental health issues would be difficult but I have often though it would be good if an internationally understood sign could used by staff to identify they have been trained in assisting with people with mental health issues. There is the wheelchair sign for the physically disable so why not for people with mental health issues. I may be suffering from a physical disability but the pain suffered does bring its own type of problems with mental health. I have seen considerable changes in attitude to the physically disabled but why is it only recently that mental health issues are dealt the same determination. Great to see this issue being raised and discussed so intelligently on this site. Faith in humanity is temporarily restored! Excellent article, mental illness needs to be included in our society in all walks of life including travel but not treated ‘special’ . I regularly travel abroad with my husband who has mental health problems, I agree that airport’s and tour operators need to be more transparent and plain with their rules as without my intervention my husband couldn’t travel and that’s not fair nor respectful to him. Being human includes all beings regardless of their mental state. We need to remove the stigma and it starts with you and me! If I choose to take a lift at the airport as well as a physically impaired person, that’s my choice, just make similar choices available to assist our fellow beings faced with mental health challenges. Great article but one area that can cause a lot of anxiety is the crowding on planes. Being in such close proximity to other passengers worsens my anxiety. Obviously on long haul there are business class and first class seats but I certainly can’t afford them. Imagine the feeling of claustrophobia when in the middle seat of three between two strangers on a crowded flight. That’s a very good point Fiona. It’s not all that easy to make sure you get a seat that’s best for you either, at least, not without paying through the nose for it to pick it in advance! Great stuff…I think you’ve made some really fascinating points. Keep up the great work. As somebody who’s been sexually abused as a child I’m too scared to fly because of what happens at security these days – it would feel like reliving what happened to me as a child. This means I have been unable to see my elderly great-aunt in India for 9 years. Speaking out about this has resulted in my being bullied and the trauma of this and the continued separation from my great-aunt has caused me to consider suicide. I have spoken to somebody recently who thinks my needs might be able to be met through already existing laws on reasonable adjustment but it took me the best part of 10 years for somebody to do this – in the past everybody used to attack me and say I should take therapy so I can learn to cope with whatever security officials do to me. As a result of my concerns being taken seriously my mental health has improved. I don’t think a lot of people realise just how big an impact inflexible measures that don’t take into account passengers with special needs can have on someone. They say “if you don’t like it don’t fly” but for some people like myself that doesn’t just mean not being able to go on holiday, for me it means having my family torn apart. Thank you for sharing your story with us; I’m very sorry to hear of the continued trauma you have endured. I totally respect your opinion and I couldn’t agree more that the impact of inflexible measures can be triggering for some people. I must say though, it may not be as bad as you think, I really don’t mean that in a dismissive sense at all. In Uk airports, passengers are only body searched if, when they go through the scanner, it alerts the security personnel to something; usually a piece of jewellery or a belt that sets off the metal detector. In this case, a member of staff will wave a wand over your body, or ask you if you have any jewellery on etc. and there will usually be a female officer present; if there isn’t you can of course request one. The best thing you can do is to place all items in the trays before they go through the scanner, including phones, jewellery, belts etc. Sometimes you may be asked to remove your shoes, but this is before you go through the scanner. In most cases, the only contact you have with the security staff is a polite nod as you walk through the scanner and they usher you to collect your belongings. I do hope this can reassure you that you will be perfectly safe and thus means you can travel to see your Great Aunt.